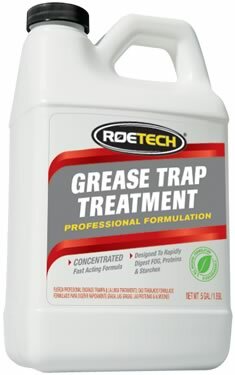 Your FOG control and elimination program is incomplete without the advanced biological technology found in ROETECH Grease Trap Treatment. GT has been designed to work in any system where large amounts of food derived fats, oils, and grease (FOG) are generated and released; which makes GT ideal for use in the Institutional food service and Hospitality industries. Regular use of GT will significantly reduce noxious odors and also reduce excessive costs associated with high grease loads. For best results, apply GT at night when water flow is reduced to a minimum. Apply directly to sink drains, floor drains, grease interceptors, or grease traps.